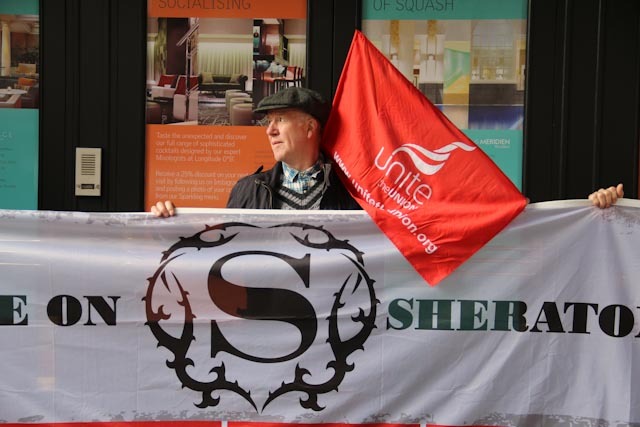 The IUF's UK affiliate Unite the Union organized an action in London on April 2 to show support for the IUF's Shame on Sheraton campaign (click here to read more). Activists protested outside Le Méridien Piccadilly and then moved on to Sheraton Park Lane. Leaflets were handed out to customers and passers-by. Protesters chanted "Shame on Sheraton" to bring attention to the plight of dismissed trade unionists at Sheraton hotels in Ethiopia and Maldives.